(TFTP) As TFTP reported last week, it was revealed that both the Obama campaign and the Trump campaign used third-party integrations to collect private information on millions of unsuspecting Facebook users. The resultant scandal has sent Facebook’s stock tumbling as well as created a firestorm for Mark Zuckerberg and his fellow data miners. Remaining conveniently out of the scrutiny, however, is Google, whose data mining of private information, according to a recent report, dwarfs that of Facebook. Web developer Dylan Curran, based in Waterford, Ireland, is making headlines this week after he recently downloaded both his Facebook data file and his Google data file. As TFTP has reported, the information Facebook keeps on its users is utterly mind-blowing, consisting of everything from text messages to liked posts, the social media giant is building profiles on billions. However, according to Curran, this is nothing compared to what Google has. “Want to freak yourself out? I’m gonna show just how much of your information the likes of Facebook and Google store about you without you even realising it,” Curran wrote before giving a breakdown of all the information insidiously gleaned by these information giants. Google stores your location (if you have location tracking turned on) every time you turn on your phone. You can see a timeline of where you’ve been from the very first day you started using Google on your phone. 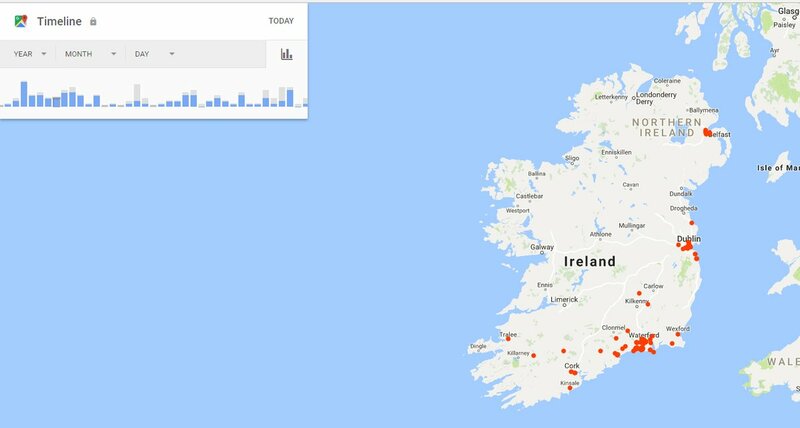 Here is every place I have been in the last 12 months in Ireland. You can see the time of day that I was in the location and how long it took me to get to that location from my previous one. 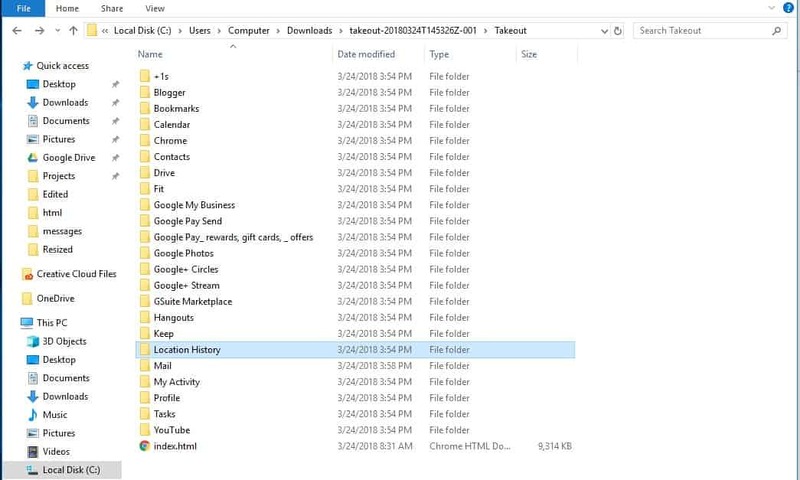 Google stores search history across all your devices. That can mean that, even if you delete your search history and phone history on one device, it may still have data saved from other devices. Google creates an advertisement profile based on your information, including your location, gender, age, hobbies, career, interests, relationship status, possible weight (need to lose 10lb in one day?) and income. Google stores information on every app and extension you use. They know how often you use them, where you use them, and who you use them to interact with. That means they know who you talk to on Facebook, what countries are you speaking with, what time you go to sleep. Google offers an option to download all of the data it stores about you. I’ve requested to download it and the file is 5.5GB big, which is roughly 3m Word documents. Manage to gain access to someone’s Google account? Perfect, you have a diary of everything that person has done. Curran then goes on to list all the Facebook data before focusing back in on Google. I got the Google Takeout document with all my information, and this is a breakdown of all the different ways they get your information. 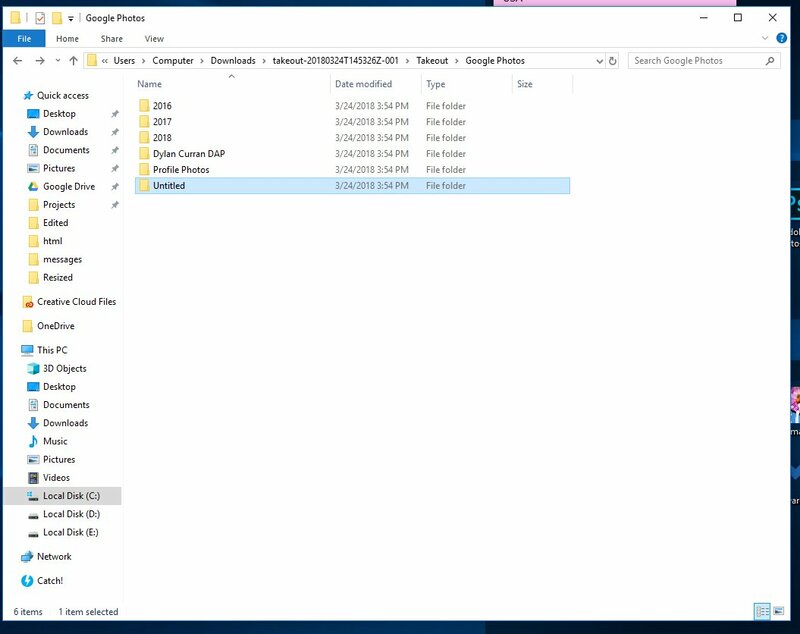 According to the file, Google knows every image you’ve ever downloaded and where you accessed them. They also know what events you’ve attended and when—even when you don’t enter them in your own calendar. What’s more, even if you’ve deleted all this information, Google still has it! 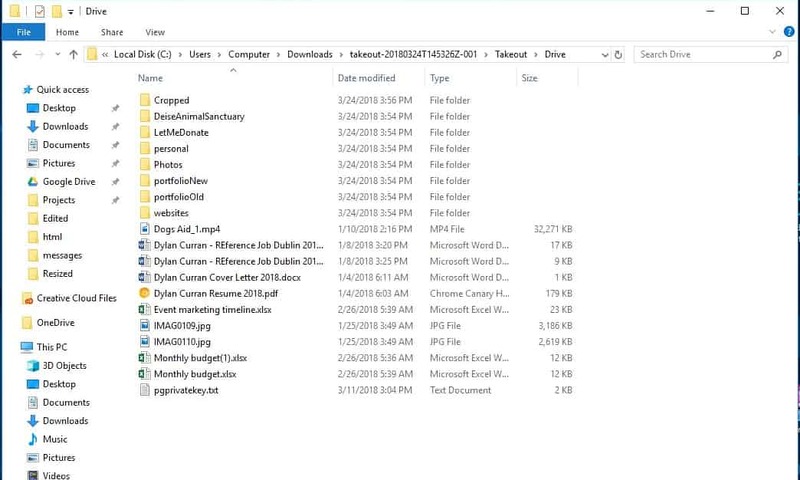 “This is my Google Drive, which includes files I explicitly deleted including my résumé, my monthly budget, and all the code, files and websites I’ve ever made, and even my PGP private key, which I deleted, that I use to encrypt emails,” explains Curran. Google even knows your workout routine as the fit app maintains records of all of it. They also maintain all of your photos, even deleted ones. “This is all the photos ever taken with my phone, broken down by year, and includes metadata of when and where I took the photos,” said Curran. But that’s not all. They also have every email you’ve ever sent and received, including deleted ones and spam. The have a record of every single website you’ve ever visited, every search you’ve ever done, every app you’ve ever used, and every news article you’ve ever read. This information has millions of nefarious uses. You say you’re not a terrorist. Then how come you were googling Isis? Work at Google and you’re suspicious of your wife? Perfect, just look up her location and search history for the last 10 years. Manage to gain access to someone’s Google account? Perfect, you have a chronological diary of everything that person has done for the last 10 years. This is one of the craziest things about the modern age. We would never let the government or a corporation put cameras/microphones in our homes or location trackers on us. But we just went ahead and did it ourselves because – to hell with it! – I want to watch cute dog videos. If we continue to be okay with unknown corporate entities watching our every move, collecting every bit of our personal information, and using all of it against us, the words “freedom” and “privacy” will become but a fleeting memory. While you may think you have nothing to hide if you’ve done nothing wrong, it’s only a matter of time before someone deems your completely legal behavior a threat—and uses this massive spy tool to stop that threat. Now for the solution. Stop giving Google all these permissions, go through your device’s permissions and disable everything that may let Google collect your information. Stop using letting Google record you by disabling the voice recognition. Use browsers like Firefox or TOR that don’t spy on you. Use search engines like DuckDuckgo.com. Use VPNs and quit paying for internet services that allow third-parties to collect your information. Unless we reclaim our privacy now, we will be responsible for the insane information dystopia that we create. Matt Agorist is an honorably discharged veteran of the USMC and former intelligence operator directly tasked by the NSA. This prior experience gives him unique insight into the world of government corruption and the American police state. Agorist has been an independent journalist for over a decade and has been featured on mainstream networks around the world. Matt is the founder of The Free Thought Project.